It was another Charles across the channel who perhaps best summed up the fascinating relationship between visual artists and Charles Dickens, whose bi-centenary is celebrated this year. Charles Baudelaire, writing in 1863, said that the painter of modern life was “a mirror as vast as the crowd itself; or to a kaleidoscope gifted with consciousness, responding to each of its movements and reproducing the multiplicity of life and the flickering grace of all the elements of life. He is an ‘I’ with an insatiable appetite for the non ‘I’, at every instant rendering it in pictures more living than life itself, which is always unstable and fugitive”. Dickens was equally mesmerised by the far more populous London as Baudelaire was by Paris. The metropolis tripled in size in Dickens’ lifetime*, from one million in 1815 to over three million by 1860. The insomniac author’s late night roaming through the darkest corners of London, which he set down in Night Walks, has been evoked in William Raban’s recent film The Houseless Shadow. Dickens’ cry against the social inequalities of the Victorian epoch made him one of the most popular writers of all time – even though extreme aesthetes, like Oscar Wilde, considered him ludicrously sentimental. Dickens never forgot the gruelling years of his childhood when his father was imprisoned for debt and he was sent to work in a warehouse near Charing Cross, pasting labels on bottles of bootblack. He did not actually meet George Frederic Watts, though as two of the best-known personalities of their day they must have known of each other. But in a well-paced display through the intimate and varied spaces at the Watts Gallery a shared sense of injustice at the horrors inflicted by industrial capitalism upon the poor and vulnerable comes across. Watts became best known for his iconic image of Hope in which a blindfold figure sits crouched on top of a globe, which he painted in 1885-6 aged nearly 70. His sculpture Physical Energy still looms over Hyde Park, the embodiment of the imperialist spirit which the elderly painter endorsed. But in his younger years, returning from an idyllic trip to Italy, he was shocked by the poverty that accompanied the industrial revolution in England and Ireland. In response, he produced four harsh, unsentimental paintings which focused on the plight of the poor and hungry. 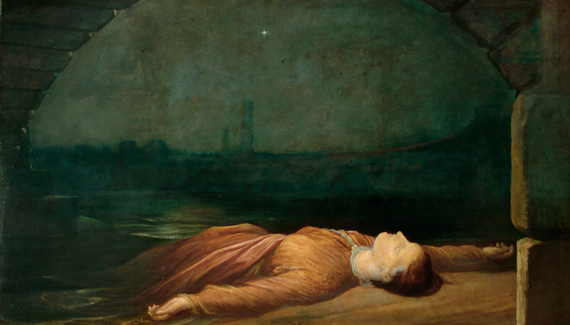 Watts had no success with his canvases depicting a drowned woman and a starving family, in contrast to Dickens, whose characters rapidly became household names. These figures, unlike his sought-after portraits, have a kind of anonymity, a symbolic significance. Dickens, on the other hand, brought his characters to life as unforgettably idiosyncratic and believable personalities, drawn from his impoverished childhood and his early experience as a journalist and legal reporter. Robert Buss’ watercolour, Dickens Dream (from the Charles Dickens Museum) provides a wonderful introduction to the writer, with its myriad of tiny scenes floating through the authors’ study as he daydreams in his famous chair. Other characters are brought to full life by a score of painters. There is Tate Britain’s claustrophobic but touching Kit’s Writing Lesson by Robert Martineau, plus six versions of Little Nell as imagined by Holman Hunt, John Ritchie, James Lobley and even sculpted in porcelain. Curator Mark Bills has tracked down the close relationship between the writer and visual artists. He explains how, despite a critical beginning when Dickens notoriously savaged the young painter John Everett Millais, the bigger picture was that he “gave Frith and other artists . . . the confidence to depict the world around them”. Everyday, ordinary people’s lives had hitherto been seen as less dignified and worthy than mythological and history subjects for artists. 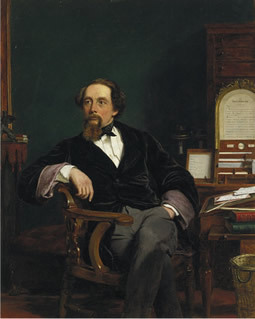 Dickens’ writings, therefore, Bills notes, “offered new opportunities for artists and a freedom to explore modern life as a valid subject”. The artist closest in spirit to Dickens is of course William Powell Frith, whose 1859 portrait is the best-known image of the writer. Frith's grand panoramas detail the hurly-burly of metropolis life. His epic, The Railway Station (1862) from Royal Holloway College, is almost worth a visit on its own. How close Dickens’ passage in Dombey and Son is to Frith’s painting, and how amusingly George Elgar Hicks’ The General Post Office, One Minute to Six, captures the excitement of Dickens in his Household Words. It’s worth reflecting that it was also in 1862 that Manet painted his groundbreaking Music in the Tuileries, a comparable swathe of contemporary life, albeit focusing on the Paris intelligentsia. Monet, Pissarro, Renoir and the Impressionists-to-be were also breaking from the academic tradition and turning to the here and now as their subject matter, though without the overtly social and moral dimension to be found in Dickens and his artist friends. 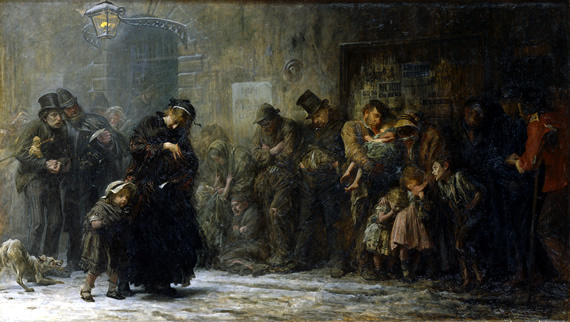 It was perhaps with Luke Fildes that the most haunting affinity with Dickens emerges. His still shocking Applicants for Admission to a Casual Ward (also from Royal Holloway College) is as epic and grand scale as Frith’s The Railway Station. But it does not soften the message with humour. Here are the real down and outs, desperate for a roof over their heads as they huddle in the slush and snow. Dickens satirised the punishing Poor Law Amendment Act in his book, Our Mutual Friend. It was Fildes’ simple engraving of Dickens’ empty chair, made in 1870 after the author’s death, which inspired Van Gogh’s iconic Yellow Chair. 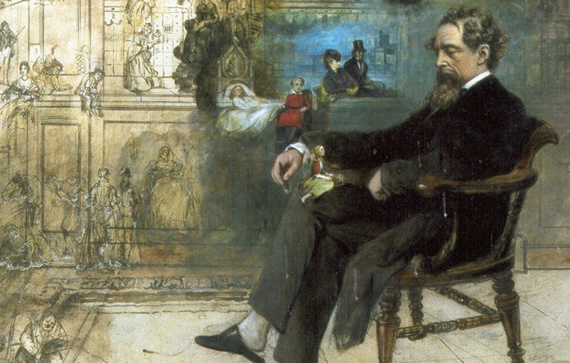 Dickens and the Artists at the Watts Gallery provides new perspectives on Victorian art and artists, seen through the prism of the era’s greatest novelist. If you haven’t had the chance to see this arts and crafts gem of a building rescued from decay by superbly thought-through refurbishment that loses none of its quaintness, now is the time to go. A big-city quality exhibition without the price, set in the idyllic Surrey countryside. Dickens and the Artists is at Watts Gallery, Down Lane, Compton until 28 October. Open Tuesday to Sunday. Admission £6.50/£3.50. Discounted Tuesdays £2. Plus a great tea room. * See Dickens Victorian London 1839-1901, by Alex Werner and Tony Williams, Museum of London. Ebury Press.